After releasing the Vembu BDR Essentials edition last year, Vembu extended the package limit up to 10 CPU sockets to satisfy SMB requests. With this new offer, the BDR Essential Edition is now able to protect up to 100 VMs supporting a maximum of 10 CPU sockets increasing the previous limit of 50 VMs and 6 CPU sockets. Increasing the number of VMs and CPU sockets supported, Vembu made a big effort to offer an affordable backup solution to help small companies to have an efficient data protection solution for their virtual environments reducing dramatically the backup expenses. 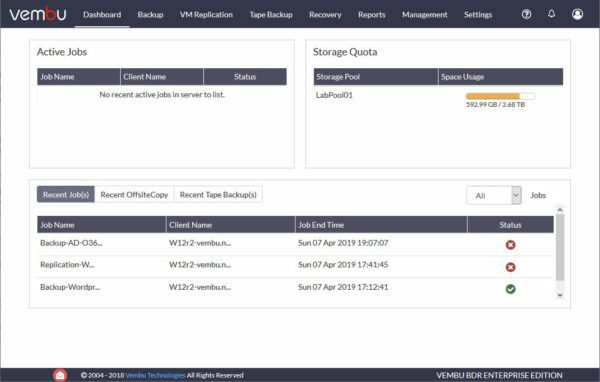 Agentless VMBackup - configuring a single job you are able to easily backup multiple virtual machines in few steps. The most appropriate data transport mode is selected automatically by the software depending on the backup infrastructure. Continuous Data Protection - this feature allows an RPO of 15 minutes only reducing data loss. Instant Recovery - VMs can be booted directly from backup repositories reducing the RTO. Automatic backup verification - ensures backups are not corrupted and can be used with no issues. Replication - to limit service disruption in case the production site fails, virtual machines can be replicated to an offsite location with Vembu OffsiteDR and Vembu CloudDR for a quick restore. Standard Edition - edition oriented to SMB businesses, provides all basic functional options. Enterprise Edition - in addition to basic functional options, provides advanced features such as Tape Backup support, VM replication, Persistent boot, advanced GFS retention, etc. Free Edition - provides unlimited features up to 3 VMs and backup for unlimited hosts with limited features. Vembu BDR Suite 4.0 is available to download as free 30-day trial.